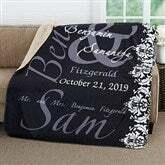 Our luxuriously, soft The Wedding Couple Personalized Premium Sherpa Blanket is wonderfully constructed of a silken faux micro mink front accompanied by a faux sheepskin Sherpa back side, making it a popular choice for rest and relaxation. You have to feel it to believe it! We take the couple's formal first names, nicknames (optional), last name and their wedding date and feature them within our exclusive damask design for all to see! Choose from 6 color combinations...white, black, grey, steel blue, tan and brown; sure to match any home décor!